"I'd selected this location earlier in the day when I was looking for a suitable evening spot for photography. 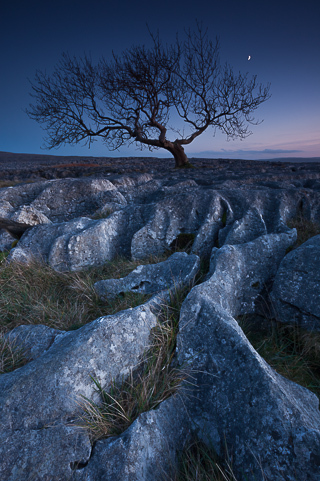 I found the shapes of the limestone rocks in the foreground particularly pleasing, providing a strong foreground element. When I returned later, unfortunately the long shadows thrown by the setting sun disrupted the natural contours of the rocks. However, once the sun had set the strong lines were again evident. As the light began to fade, the scene took on an unworldly look in the twilight. The bright rising crescent of the moon added to the overall atmosphere of the scene."